The American Society of Civil Engineers’ (ASCE) latest Report Card for America’s Infrastructure, issued every four years since 2001, recently gave the nation’s water and wastewater systems a D grade, up slightly from the D- in the last two reports. Of course, this year’s minimal change is not a cause for celebration, and is in fact a further confirmation of the need to update and maintain water infrastructure to ensure resiliency for health, safety, and robust local economies. A breakdown of water systems can result in water disruptions, impediments to emergency response, and damage to other types of infrastructure, as well as unsanitary conditions, increasing the likelihood of public health issues. Allowing the country’s water infrastructure to lapse puts many communities at risk. Although new pipes are being added to expand service areas, drinking water systems degrade over time, with the useful life of component parts ranging from 15 to 95 years. Especially in the older cities, much of the infrastructure is in need of replacement. Failures in drinking water infrastructure can result in water disruptions, impediments to emergency response, and damage to other types of infrastructure. Broken water mains can damage roadways and structures and hinder fire-control efforts. And unscheduled repair work to address emergency pipe failures may cause additional disruptions to transportation and commerce. It is estimated that more than one million miles of water mains are in place across the United States. The conditions of many of these pipes are unknown, with some dating back to the Civil War era. So what can be done to raise the grade? The estimated price tag for critical upkeep and replacement of the nation’s outdated water systems is approximately $1 trillion over the next 25 years. But while that is a significant amount, there are solutions, including attracting additional private capital for public water infrastructure projects. This is an investment in our country’s future that will prove its value not only in the infrastructure itself, but also in the jobs and economic growth that come with the associated projects. America’s drinking water systems are aging and must be upgraded or expanded to meet increasing federal and state environmental requirements that add to the funding crisis. Not meeting the investment needs of the next 20 years risks reversing the environmental, public health, and economic gains of the last three decades. 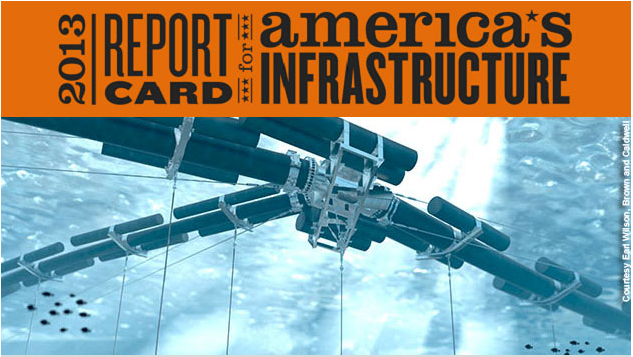 Rather than dwell on the bad grade, what we can learn from the ASCE Report Card is that there are actions that can be taken to get back on the right path. By working together on needed improvements, we can keep the water flowing now and well into the future.